By Kori ~ June 6th, 2012. For many, Oregon wine is synonymous with the Willamette Valley. However, there are exciting things happening elsewhere in the state, including the Columbia Gorge, Southern Oregon, and, of course, the Oregon side of the Walla Walla Valley. Today, Oregon boasts over 400 wineries and 16 AVAâ€™s (American Viticultural Areas). With those AVAâ€™s found in both warm and cool climates, Oregon winemakers are able to produce wines from over 70 different grape varieties. During my recent media tour to explore Oregon wine country, I had the opportunity to visit the Columbia Gorge again and participate in a tasting of Southern Oregon wines. 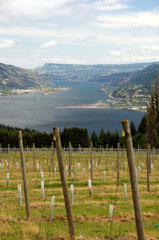 The Columbia Gorge AVA was established in 2004. It runs along the Columbia River and encompasses areas in both Washington and Oregon. Located just 60 miles east of Portland, the area boasts gorgeous views, numerous outdoor recreation options, quality vineyards, great wines, and very friendly folks. The Pines Vineyard, located in The Dalles, Oregon, is home to some of the oldest vines in the Northwest. Their Old Vine Zinfandel vines are over 100 years old. On a trip to the Columbia Gorge in 2010, we toured The Pines Vineyard with owner Lonnie Wright. Two wines that I especially enjoyed during my most recent visit to the Columbia Gorge were the 2010 Viento Pinot Noir, Oak Ridge Vineyard [Quality: 4, QPR: 5, Price: $33] and the 2010 Viento Gruner Veltliner, Underwood Mountain Vineyard [Quality: 4, QPR: 4, Price: $20]. If you have not spent any time in the Columbia Gorge, I highly recommend it, for both outdoor recreation and wine tasting. And, when you are in Hood River, be sure to dine at Noraâ€™s Table. They offer amazing food and an Oregon-focused wine list. The Southern Oregon AVA was also established in 2004 and is comprised of three sub-AVAs, the Umpqua Valley, the Rogue Valley, and the Applegate Valley. The Umpqua Valley, established in 1984, is actually Oregonâ€™s oldest viticulture region. This region has been slower to develop, in part because they do not have a single-varietal focus. However, they seem to have finally turned a corner and are embracing their diversity. The rugged terrain and varied microclimates in Southern Oregon produce both warmer climate varieties like Cabernet Sauvignon, Syrah, Merlot, and Tempranillo as well as small amounts of cool climate varieties like Pinot Noir. 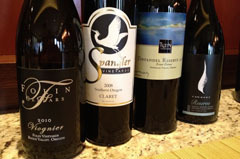 Four wines that I especially enjoyed during the tasting of Southern Oregon wines were the 2009 Folin Cellars Viognier, Rogue Valley [Quality: 4, QPR: 3, Price: $25], the 2008 Spangler Vineyards Claret [Quality: 4, QPR: 4, Price: $25], the 2008 Troon Zinfandel Reserve, Applegate Valley [Quality: 4, QPR: 2, Price: $60], and the 2008 Cowhorn Vineyards Syrah, Applegate Valley [Quality: 4, QPR: 3, Price: $45]. And, while we did not visit this area during the media tour, I would be remiss without mentioning that a number of the best Walla Walla Valley vineyards are actually on the Oregon side of the AVA. If your travels take you to Walla Walla, Washington, I encourage you to drive ten minutes south to Milton-Freewater, Oregon. While most of the vineyards themselves are not open to the public, you should definitely visit Watermill Winery. The Brown family, a third generation apple-growing family and the owners of Blue Mountain Cider, founded Watermill Winery in 2006. Before launching their own winery, grapes grown by the Brown family were used for other prestigious wines from Northstar Winery, Seven Hills Winery, and Saviah Cellars. The Brown family owns some prized land in an area called â€œThe Rocksâ€ by the locals. They have pulled up some of their apple orchards to plant vineyards, and there is potential for even more vineyards to be planted on their land in the future.